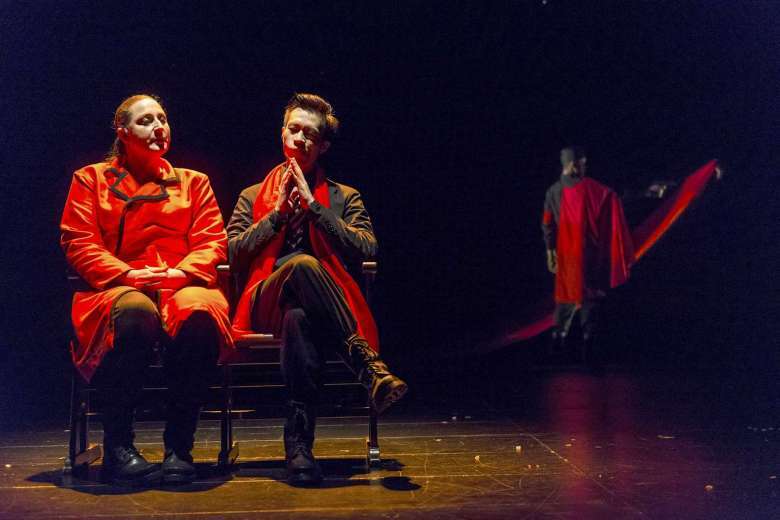 This ambitious play, the first of a planned trilogy by playwright-director Chong Tze Chien on Adolf Hitler, seeks to interrogate the life of the German dictator and provide us a fresh context in which to view the man. Chong frames his play as a trial where a Nazi Prime Minister (Joshua Lim) questions Ava Braun (Edith Podesta), Hitler's mistress, to find out more about him. Braun simply cannot fathom how the man she grew to love so much could be capable of acts of horrific violence and starts painting a portrait of him for us. We are swept back to a calmer world which presents Hitler (Daniel York) as a struggling painter called Jekyll who fails to get into an art academy and is reduced to hawking his work for money. Braun, a gallery owner, takes pity on him and brings him into her world and gradually, her heart. Little is she aware that Jekyll battles his own demons. He is confronted by a voice deep within him that champions the provenance of a pure Germanic race, spurring him to eradicate Jews whom he feels have unfairly robbed him of artistic advancement. Taking on this Jekyll and Hyde template, the mild-mannered artist is powerless to control the machinations of his alter ego. Massacres of Jews erupt all over town as the latter's acts grow more insidious. Lim's character, a junior police inspector at the time, is tasked with the job of cracking down on this brutal serial killer, all the while hiding his own secret: his beloved childhood nanny (Jo Kukathas) is herself a Jew and has been staying with him. The production is carried by the strength of its ensemble cast and there are particularly powerful turns from York, who invests the titular character with malevolence and melancholy, and Podesta as a strong yet tragic voice of reason. In a nod to the company's roots in puppet work, Chong makes extensive use of shadows, where actors enact scenes behind a white screen, looming larger or smaller as they move deftly around the lights. Lim Woan Wen's lighting and Darren Ng's soundscapes contribute to this evocative and visually sumptuous experience, with black and red forming rich colour palettes. Yet, one remains unsure what Starring Hitler seeks to achieve. Is it meant to humanize a tyrant like Hitler by painting him as a victim of split personality? Or does it seek to satirize the state agenda of controlling artistic expression which results in its own downfall? There are various strands to the tale that do not fully interlock. Julius Foo appears as a closeted police commissioner whose clandestine relationship with a younger officer proves to be his undoing. This homosexual theme however seems to be only incidental to the plot. Likewise, Jekyll makes powerful speeches about the merits of art, giving the play the feel of a performance-lecture which rails against arbitrary censorship of the arts. What this adds to the rest of the narrative remains unclear. A more powerful metaphor is offered in the opening and closing sequences which feature the cast standing in a row, bearing placards with their actual ethnicities. They then flip this around to reveal the words 'Jew' or 'German' to reflect the characters they are playing. The point here seems to be that we are all, always and inevitably, pigeonholed by our identities: be it racial, religious or political. 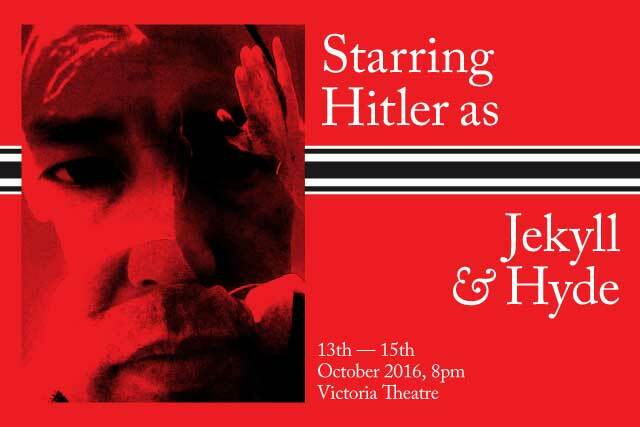 Starring Hitler is a play of rich ideas and richer contradictions. Chong may not have something classic on his hands just yet but he has certainly crafted an intelligent work that does not shy away from asking some hard questions. It's just sometimes important to know what these questions actually are.